Question: What change took place through Abraham? After twenty generations of failure, the privilege of being יהוה ‘s Chosen People was earned by Abraham and his offspring. Abraham did not win his new status by default; he had to prove his greatness by passing ten tests of faith (Avos 5:4). Question: What was Abraham’s first test of faith? The first trial mentioned in Scripture is the command that Abraham give up his entire past and follow יהוה ‘s lead to a new land. The Torah expresses Abraham’s test in ascending degrees of difficulty. It is hard for someone to leave his homeland, even harder to leave his extended family, and hardest of all to leave his parents (Ramban). Abraham and Sarah severed all ties with their past and loved ones — when they were 75 and 65 years old. Question: Did יהוה tell him where he was going? 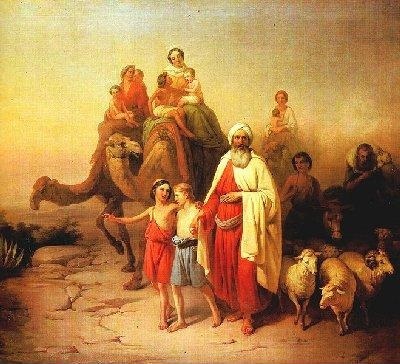 יהוה did not reveal the land to Abram immediately, but יהוה showed Abram the land only after he had been obedient and followed His commands and arrived in the land. יהוה enabled him to be rewarded for every step he took in faith. Question: What is a Heavenly test? A Heavenly test is one that forces a person to choose between יהוה ‘s will and his own nature or understanding of what is right. Clearly, it would be no challenge to Abraham, who was the epitome of kindness, to be asked to help the needy, but it would be a supreme test of faith for him to desert his aged father and homeland or to give his cherished, beloved son as an offering [see Chapter 22]. Thus, Abraham was tested by being forced to make secondary his wishes and wisdom to what יהוה desired for him to do. By doing so, he demonstrated his conviction that man’s highest goal is to accept the Divine wisdom as the only truth. Question: Since יהוה knows all future events and how every person will respond to any given situation, why was it necessary to test Abraham? Of course the outcome is never in doubt to יהוה , for He knows that the person being tested will persevere. To the contrary, a just יהוה does not impose trials that are beyond the capacity of the individual — יהוה tests only righteous people who will do His will, not the wicked who will disobey. Thus, all the Torah’s trials are for the benefit of those being tested. But that is known only to יהוה . The person being tested has free choice, and he must find the strength and wisdom to choose correctly. If he does, then he has translated his potential into action and made himself a greater person, for actual deed far outweighs mere potential in the Heavenly scales of judgment, and he can therefore be rewarded for what he did, rather than for what he was merely capable of doing.